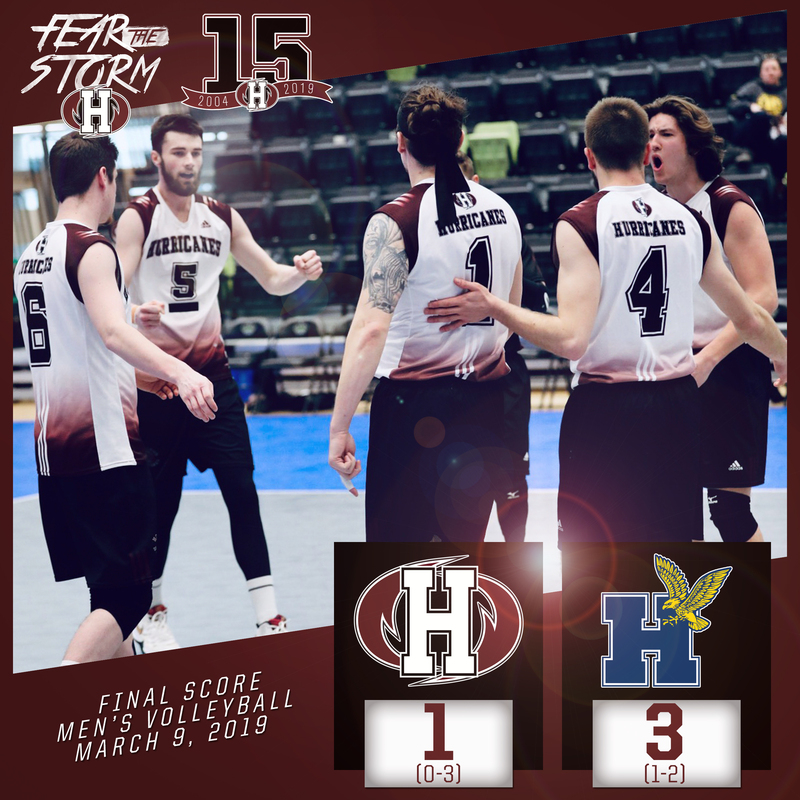 The Holland Hurricanes men’s volleyball team completed their season on Saturday with a loss versus the Humber College Hawks in four sets. The game was the placement match at the 2019 Canadian Collegiate Athletic Association (CCAA) National Men’s Volleyball Championship in Red Deer, Alberta. With the loss the Hurricanes finished the tournament at 0-3 and in eighth place. Set scores on Saturday versus the Hawks were 25-16, 20-25, 25-19 and 25-18. Top performers for the Hurricanes in Saturday’s match were Brett Butler (15 kills) and Simon Archibald (five digs). Dylan Devecseri (12 kills) and Edua Silva Ferreira and Kamyn Wilkins (each with nine digs) were the best statistical performers in the match for the Hawks. Nicholas Menzies was the Player of the Game for the Hurricanes. This was the final match of the season for both the Hurricanes and Hawks. The Hurricanes finished the regular season with a record of 8-7 in Atlantic Collegiate Athletic Association (ACAA) competition and entered the playoffs in third place. At the 2019 ACAA Championships hosted by the Hurricanes at the Holland College Centre for Community Engagement, the ‘Canes defeated the number two seed, University of New Brunswick-Saint John Seawolves in straight-sets in semi-final play, before claiming their second conference championship in team history when they defeated the top-seed St. Thomas University Tommies in four-sets in the championship game. This was the third time the men’s volleyball Hurricanes competed at the CCAA National Men’s Volleyball Championship since 2015. For more information on the 2019 CCAA National Men’s Volleyball Championship, including statistics, results and photos, visit www.ccaa.ca. To connect with the men’s volleyball Hurricanes, visit www.twitter.com/canesmvball. For more information on the Holland Hurricanes, visit www.hollandhurricanes.com, www.facebook.com/hollandhurricanes, www.twitter.com/hc_hurricanes and www.instagram.com/hollandhurricanes.